The Kleine Scheidegg-Männlichen ski paradise comprises of 19 modern lifts and 110 km beautiful prepared slopes and belongs to the most popular winter sport regions in Switzerland. Not just ski fans, but also those taking a more leisurely approach and beginners will find exactly what they are looking for. Numerous coy mountain restaurants and bars guarantee that authentic feeling beside the slopes. 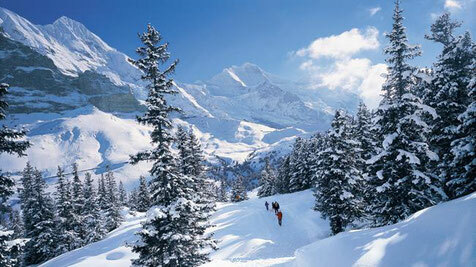 In January the Lauberhorn Ski Race, the longest and probably the most spectacular World Cup Race, takes place here. Prices from CHF 675 per person for 7 nights in a double room including daily breakfast buffet. Contact us for an individual offer!